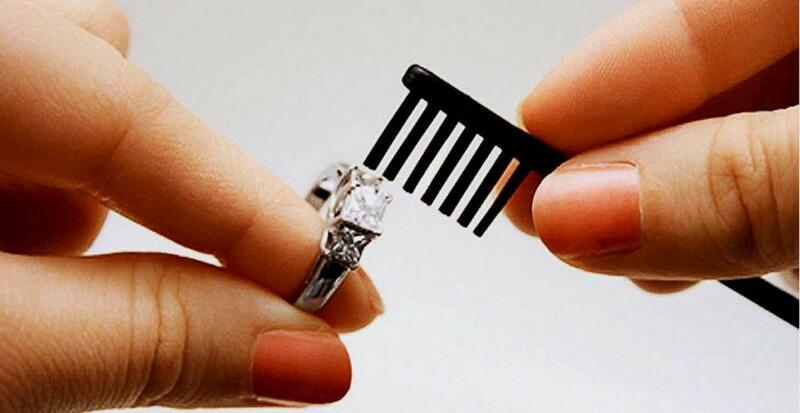 Now that you’re engaged, you will want to know how to clean diamond ring. We are sure that you are enchanted by your sparkling new diamond and know that you want to make sure it doesn’t lose its luster. However, you want to know the proper way how to clean a ring so you do not chip, scratch or otherwise damage your beautiful engagement ring. We have asked expert jewelers on the safest way to clean your engage ring at home. In order to make sure that your ring maintains its shine is to clean it regularly. This will not only keep your ring shiny and sparkly, it will help extend its life. As every ring is unique, you need to be sure that you are following the proper care and cleaning instructions for your particular ring. It is recommended that you take your ring to your professional jeweler at last twice a year to have it inspected and professionally cleaned. As well, if you ring is especially dirty, you should take it to a jeweler to have it cleaned instead of cleaning it at home. Never use harsh cleaning chemicals such as bleach, ammonia or acetone to clean your ring as this will cause severe and permanent damage to the diamond and the band itself. The best method for cleaning your diamond ring, regardless of the setting or metal is to use a mild liquid dish detergent, such as Dawn Liquid Dish Detergent and warm (not hot) water. Add a drop or 2 of liquid dish detergent to warm water and soak it for 15 to 20 minutes. Use a soft-bristle toothbrush to gently remove any residue such as hairspray, lotion and so forth. Then soak the ring in clean warm water to remove the soap residue and dry with a soft cloth. Never use any harsh chemicals such as chlorine to clean your diamond engagement ring. For rings with a silver or gold band, you can use a 50/50 solution of hydrogen peroxide and Windex. Soak your ring for no more than 15 minutes and then scrub it with a soft toothbrush and rinse with warm water to remove any remaining residue. Dry gently with a clean soft cloth. Windex will remove any build up while hydrogen peroxide helps kill bacteria and germs. If your solid gold diamond engagement or wedding band is losing its shine, you can actually clean it with beer. Simply pour a small amount of beer on a soft cloth. Then rub it gently on the band itself and towel it dry with a separate clean and dry soft cloth. Do not clean the diamond with the beer however. As well, you should not use darker ale beers for this process. Pour 2 tbsp baking soda and ½ cup white vinegar into a shallow bowl and mix until the baking soda has dissolved completely. Then allow your ring to soak for up to three hours before rinsing with cold water and drying with a soft cloth. If you silver ring is starting to tarnish, kitchen is a sure fire way to bring back the shine! Pour a small amount of ketchup in a shallow bowl and dip your silver ring in the bowl for just a few minutes only. Then work the ketchup into the crevices of your ring and rinse with warm water. Dry with a soft cloth. Store your ring in a safe place such as jewelry box or ring box. Never remove your ring in public. If you have to do so, carry a ring box and keep it in a safe place such as your purse. Never leave it unattended. Remove your ring before swimming or vigorous sports to prevent damage. Please, remove your ring before cooking. Remove your ring before doing the dishes. Lotions and creams can leave a harsh, thick residue on your diamond ring and cause your band to tarnish, especially if its made of white gold or platinum. Make sure your engagement ring is properly insured. Avoid the use of “at home” ring cleaning machines as these are not designed for fine gemstones such as diamonds and can damage your ring. We hope you have found these tips on how to clean diamond rings at home to be helpful. Remember, you diamond engagement ring is priceless so take utmost care of your ring so you can enjoy it for years to come!